You may have heard the term A.B.C. at some point. Most people hear A.B.C. and they start to sing the alphabet song. To those in sales A.B.C. means something very different. Salespeople most likely hear the voice of Alec Baldwin as Blake in the movie Glengarry Glen Ross reminding the other salesmen in the room to Always Be Closing. Today it is finally time to move farther down in the alphabet and instead of always thinking closing, closing, closing, how about we focus on E.F.G. 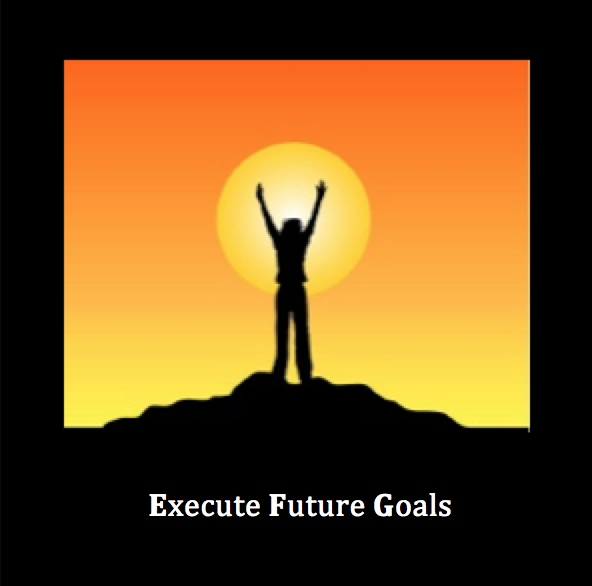 and how you Execute Future Goals. Many people miss the opportunity to set goals because they feel they will be disappointed if they set them and don’t reach them. The disappointment comes from never attempting to achieve a goal, not in the missing the mark. If you don’t set a goal how do you know where you are going? How do you know what to reach for? How do you know when to celebrate that you achieved what you were after? Goals can be set at any time of the year. That can mean the 4th quarter so you are building momentum into the start of the calendar year. It can mean as the summer approaches so you can use the energy of the warmth as a way to power you to a quick start on the path to your goal. Basically, you can set goals whenever it makes sense to you and whenever you start a new objective. Once you have a target, you can begin to Execute Future Goals. A business related sales goal. A personal exercise goal such as to run a certain distance, or to lose a number of pounds, or even to just exercise daily. A relationship goal like spending more time with the kids, or having a date night with your spouse. A goal can cover anything from writing a book, to opening a new company to hiking the Appalachian trail. What level did I reach this year? Did I get to that level by accident or on purpose? There are times when we achieve targets without even focusing on them due to natural ability. How much farther can I go or do I want to go? What is the next logical level to reach? When do I want to reach that next level? Now that you have answer to these simple questions you will have an idea of where you have been, where you want to go and just how fast you can get there. We believe that you should set your goal higher than you originally plan. We understand that you just felt that lump in your throat and we know how hard it can be. Push yourself! You might just be amazed at what you can do and will do! One of the challenges that comes with setting a goal so far away is that to some, it is discouraging if they don’t achieve the level they were aiming to reach. Here is the trick we use. Set your goal at the moon level. This is a far reaching goal and if everything goes perfectly it is something you will achieve. You should then set a challenge that is your atmosphere level. This would be a goal that is larger than what you have already been able to do and your minimum goal for next year. Now, celebrate when you break through the atmosphere level and keep going for the moon goal. You at least know you are now amongst the stars. Setting your goal will be the easy part. If you really want to Execute Future Goals this next part will be the fuel you need for continued motivation. Why am I wanting that goal? This is a stand alone question. One that you MUST answer. Knowing why you are doing something will push you, pull you, motivate you and give you something to get you going even on days you want to hide in bed. Your why will be the cornerstone that brings everything together and holds it in place. If it doesn’t make you cry, it isn’t a big enough why! You should hurt inside if you disappoint your why. You should feel that you have let your why down. If your why is truly big enough to make you feel that way, it will be the fuel to your goals. Your why can change. It might be something that is a lifelong goal, or it might be something that pushes you though a month. Whether it is long term or short term isn’t important, it just must be powerful enough to make you take action. Now you have your big goal (the moon) and you have your on-the-way goal (the atmosphere) and you have your why (the power for your voyage) now find someone that has made that trip before you and follow their path. Skip right over A.B.C. as you have now found a way to focus on E.F.G. and with a simple list of questions you will then be able to Execute Future Goals and celebrate heights you had once only dreamed about. Chadalyst – Sit down and figure out WHY you want to hit any goal you are setting. That will make a goal easier to accomplish.